45 years old; married, three children; BSN degree; Works four 10-hour shifts per week, plus occasional weekend overtime. Carolyn wears multiple hats. Working at a 300-bed nonprofit hospital, she is a caregiver, advocate, educator, collaborator, counselor, leader, nurturer and shoulder to cry on. Balancing work with childcare means that working overtime or due to last-minute schedule changes can be tough. At the end of each shift, it is easy to feel underappreciated, but making a difference in a patient’s life is rewarding enough to keep her coming back. She believes that being a nurse is a calling – it’s not for everyone. In her work, Carolyn must quickly and efficiently shift priorities based on overall patient load, changes to individual patient acuity, staffing, and planned and unplanned procedures. She is a good communicator with clinical and non-clinical staff, as well as with patients and their families, interacting successfully with healthcare teams and able to de-escalate conflict when needed. She has a basic knowledge of the disease processes for the conditions of those in her care, as well as an understanding of the medications being given and the procedures being implemented. She stays aware of patients’ physiological, psychosocial and mental health needs. Carolyn is computer literate (Facebook, online shopping, surfing the web), but is not a computer expert and doesn’t understand system-level error messages. "I am always on, thinking and working. And it’s not just that I am always on when I am there... I am on when I get home. It takes hours, sometimes days, to relax after a particularly bad day." "It’s like waiting tables when you have five to six patients, going from room to room all day, everyone always needing something. There’s a lot of repetition in tasks I perform." "My medication won’t scan... again!" "What was I doing before I got interrupted? Did I finish all my notes? I regularly end up staying 30 minutes late to finish my charting, but is anyone even reading my documentation?" "I love getting alerts and patient information, and being able to contact staff all in the same place." Ensure that all patients receive their medications and other treatments on time. Educate patients on a healthy lifestyle (medications, nutrition, exercise, durable medical equipment), and observe the patient putting the education into action. Make sure each patient and family feels like they are getting the care and attention they need. Organize the day to finish shift on time. Complete all tasks. Don’t leave a lot of extra work for the next shift. Ensure patients are discharged in a timely manner so that waiting patients can use the beds. Be able to easily see and communicate each patient’s plan of care. Become proficient in customization and optimization of EHR to improve daily workflow. Seamlessly capture data during routine provision of care (document once versus many times) in order to focus more on patient care. Stay up-to-date on continuing education required to maintain RN licensure every two years. 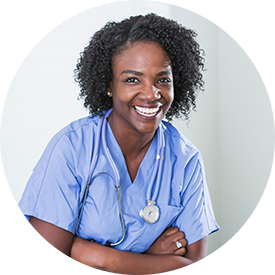 Develop and implement a training program for new graduates and other nurses new to our unit to help them get up to speed more quickly and efficiently. Staffing shortages can put nurses at greater risk for patient safety issues. Unable to locate patient records in one place. High percentage of nursing burnout, with nurses leaving the patient care workforce in favor of non-direct patient care types of nursing. Unable to speak to some patients without interpreter due to language barrier. Difficulty communicating with healthcare team efficiently so that all primary team members are kept informed. Spend a lot of time recording large amounts of information and completing documentation. Common tasks can be laborious (too much clicking). The doctor keeps reconciling the meds incorrectly, further lengthening the time required to discharge patients. Rarely doing one task at a time and constantly interrupted. Nursing staff comes up with workarounds to keep everything and everyone straight. Often feel the pressure and fatigue from the constant long shifts and don’t see an end in sight. There is no consistency. Other nurses are documenting the same information in different areas of the EHR. Complex tasks are not reflected in workflow, and it feels like nurses are an afterthought when using the software/EHR. Tasks done all the time are so hard – so many steps because the technology is physician-centric. Medication management is difficult to do. Can’t easily see what is missing or what hasn’t been done, particularly around documentation. Lack of investment in daily patient care when feeling dissatisfied with the job. Injuries are common due to improper body mechanics, standing approximately 80% of the day, and repeatedly bending and doing heavy lifting.